Watch your chickens dance and peck in a frenzy for these 100% natural whole-dried mealworms! 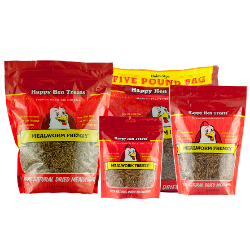 Contains 100% natural dried mealworms that chickens absolutely love to eat. Dried mealworms offer chickens the taste they love without the inconvenience of storing and handling live worms. High in protein - more protein than live mealworms. No need to refrigerate . Perfect for training or taming chickens. 3.5 oz. and 10 oz. are sold in case of 6. 30 oz. is sold in a case of 4. Options: 10 oz. 3.5 oz. 30 oz. 5 lb.